Japanese Food is a very elegant cuisine. When anyone debates, “what are the great cuisines of the world”, Japanese has to be up there on the list. It even influenced the 20th century movement in France called “nouvelle cuisine”, in terms of both preparation and presentation. 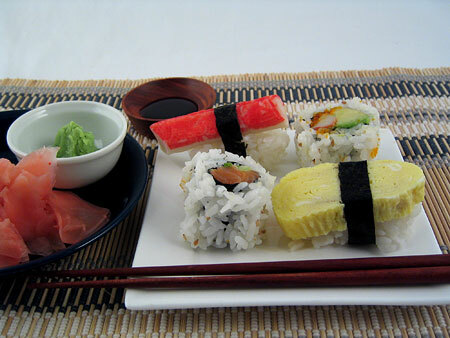 Japanese cooking has a larger number of ingredients served uncooked than in many other cuisines. It is 9/10ths preparation, 1/10th actual cooking. Despite the Japanese mania for modernity, their food remains very seasonally-based, and the people themselves remain very conservative eaters. The dishes exhibit more subtle tastes than in other Asian cooking. The Japanese don’t like the sweetness of Western desserts — to them, it is extreme — and though they are eating cheese now, they tend to avoid cheeses with strong, pronounced flavours. Coconut is also not popular. Most grocery shopping is still done in small Mum & Pop stores. The Japanese are incredibly choosy about the quality of their produce, certainly in flavour but particularly in appearance. Meat isn’t eaten in great quantities. It is usually served in very small pieces added to dishes, rather than as a hunk on its own. At one time, eating meat was even looked down on. Television cooking shows are now very popular. Two well-known cooking show stars are Makiko Fujino and Harumi Kurihara. In Japan, restaurants and tearooms will always give you a glass of tap water and an “Oshibori” wet towel when you sit down. Sushi is sold at sushi bars. You sit at the restaurant counter, and are brought an “oshibori” to clean your hands with. You give your drink order to the server; it is considered rude to ask the chef for drinks. You make a dipping sauce by mixing a small amount of wasabi with a small amount of soy sauce in a small dish provided for the purpose. You eat sushi with your fingers, and pickled ginger slices in between eating different kinds of sushi to clear the palate. Kissaten are coffee shops frequented mostly by men. They emerged after the Second World War to serve coffee, black tea (as opposed to green tea) and snacks. Amamidokoro are tea shops, preferred by women. They serve green tea and sweets. KFC Chicken has become a tradition on Christmas Eve in Japan — no one’s quite sure why. Some speculate that it is perhaps a way of having some kind of poultry instead of turkey, which isn’t generally available, and even if it were, not even a leg would fit into a Japanese oven at home. The Extra Crispy variety of KFC is particularly popular. The night is also one for couples; everyone wants to have a date for the big meal out at KFC. It used to be considered extremely bad manners to eat food while walking down the street, except at fairs. This is going by the wayside now with younger people. Women working in the restaurant industry in Japan were rare until after 1999, because employment laws made it illegal for women to work after 10pm, and restaurant work usually goes later than that. In terms of Japanese restaurants as ethnic restaurants elsewhere in the world, the food remains relatively authentic at its core, though the “fusion food” effect does influence some restaurants. The first customers in America and the UK for Chinese and Indian food were non-Chinese and non-Indian people, so those foods got adjusted for their tastes, with whole new dishes even being invented, and even today, many of the foods served aren’t very “authentic” to their native cultures. Japanese food abroad, however, was largely born on the West coast of America, with the earliest customers there being Japanese people, so the food served started out as authentic, and the menus and dishes were replicated out from there. There were Japanese restaurants in the Little Tokyo area of Los Angeles since the 1850s serving pretty much an exclusive Japanese clientele. Japanese food hit the mainstream’s attention in the 1970s, when a restaurant called “Osho” opened in Los Angeles near Beverly Hills, next to Twentieth Century Fox’s studios where it was frequented by Hollywood stars. Most kitchens are small and very cluttered, because space overall in Japanese homes is limited. Most Japanese kitchens don’t have ovens. Instead, they have a raised cooktop that sits on a counter with just two burners on top. In it, at the front, a long, narrow door opens to reveal a small “fish oven” or “fish grill” inside it. There is no room for larger ovens in Japanese kitchens. Toaster ovens are very popular; but overall, baking isn’t a traditional Japanese cooking style, anyway: baking as a cooking method didn’t start to be practised in Japan until the mid 1900s. Japanese microwaves (“denshi renji”) operate on a lower wattage than in North America. The first microwave popcorn sold there didn’t work because of this — only half would pop so it got a bad name. Dual-purpose microwaves, that are both a microwave and a convection oven (called “oobun renji”), are becoming popular. A rice-cooker is standard equipment in kitchens. Blenders and hand-mixers are expensive. Hot water comes from a separate hot water heater that heats it up as it flows out. With both men and women now working, larger refrigerators became necessary: small, “bar-size” ones were fine when women didn’t work and could do daily shopping trips. Tall models of refrigerators often have drawers in them, to keep different foods at different temperatures. The storage capacity of these larger refrigerators, though, is still only be about half that of North American ones. The most commonly-used knives in the kitchen are the deba bocho, nakiri bocho, usuba bocho, tako hiki, santoku and yanagi ba. Most home cooks use stainless steel knives, though chefs still prefer carbon steel. The best knives are considered those made in the Sakai region, particularly Osaka, where knives have been made since the 1500s. Japanese knives are usually sharpened only on one side — they prefer it that way because they feel they can get sharper knives. Soups are eaten at the same time as the main course. Soup can be sipped out of the bowl, or eaten using a Chinese style spoon. When eating, raise the dishes up to you, don’t bend down to them; bending down to them is seen as bad form. The Japanese won’t expect Westerners to be able to use chopsticks, and may be surprised when they can. Shojin-ryori is a traditional vegan style of cooking — no animal or fish products at all are used. It is practised by Buddhist priests. Kaiseki-ryori is the formal meal that accompanies the tea ceremony. Foods are served at a set order. Sauces are served on the side and used for dipping. Most dishes aren’t saucy, as there were traditionally no spoons or bread to get the sauce with. Chinese soy sauce is too strong for Japanese recipes. Everyone has his / her own favourite brand of Japanese soy sauce. When two people get married, there’s often a struggle over which brand the new household will use. The staple starch is rice, though this is relatively recent in Japan’s history. Most Japanese noodles are made from soft wheat flour. Despite the association of buckwheat with Japanese noodles such as Soba Noodles, Japan actually imports 80% of its buckwheat from China. Bread is becoming more popular at breakfast. You can order a piece of toast in Japanese coffeshops. It will be a thick slab of bread, toasted, with a knob of butter on top. The Japanese have taken what might at times a strange approach to bread and sandwiches. Popular lunch-time fast foods combine carbs with carbs, such as a hot dog bun containing pan-fried noodles flavoured with Worcestershire sauce (called “yakisoba-pan”) or a hot dog bun containing pan-fried spaghetti flavoured with ketchup (“napolitan-pan”.) Another popular sandwich is “potesara-sando”, whose filling is mashed potato with mayonnaise in it. Potatoes in Japan are grown for eating as potatoes or for processing into starch. Varieties grown include Tunika, Yukirasha, May Queen, Hokkaikogane, Touya, Sayaka, Kita-akari, Sayaka, and Irish Cobbler. More than 70% of the potatoes grown in Japan are grown in Hokkaido. It’s the only part of Japan where potatoes are grown for starch production. Hokkaido achieves some of the highest potato yields in the world (41 tons per hectare.) Since 1990, per capita consumption of potatoes has been 37 to 40 pounds (17 to 18 kg) per year. Potatoes are eaten as potato chips (aka crisps in the UK), French fries in western-style restaurants, or frozen croquettes for cooking at home. Milk production in Japan is mainly in the Chiba area near Tokyo, and on the island of Hokkaido. The climate of the northern island of Hokkaido is too cold for growing rice there. The land instead is used for agriculture that some would consider “non-traditionally” Japanese: meat and milk production, and fruits that prefer colder climates. Hokkaido has a milk marketing board. In 1997, Japan produced 8 million metric tons of milk. Much of the milk is used for products such as yoghurt and yoghurt drinks such as the brand-name Yakult, chocolate, canned or bottled milk tea, flavoured milk beverage products such as Calpis, cakes, etc. In 1997, Japanese consumers bought 200,000 tons of cheese (90% of which was imported.) In 1999, there were around 30 cheese producers on Hokkaido. They were making European-style cheeses such as Camembert, Emmenthal, and Edam. In Japanese cooking, mushrooms are almost never eaten raw, always cooked. Salt, alcohol and vinegar production in Japan began sometime in the 200s AD. Food in Japan underwent strong Chinese influence from the 500s to 700s AD. During this period, soybeans and tea were introduced by Japanese Buddhist monks who had travelled to China for study. Condiments such as soy sauce and miso came along in the 600s AD. Buddhism converted the Japanese people to being vegetarians. 1600s – Potatoes arrive in Japan at the start of the 1600s, probably arriving via Jakarta and first landing on the southern island of Kyushu. 1868 to 1912 was the Meiji era under Emperor Meiji. He wanted to modernize Japan. He encouraged his people to eat meat in the 1850s, and ate beef himself to set an example. He lifted the ban on eating meat; this had the side political benefit of weakening the power of the Buddhists. His government also encouraged Western-style agriculture in Hokkaido. In the 1860s, he allowed some Western-style eateries to start opening in port cities, largely to cater to Westerners coming in on the ships. By the 1910s, inexpensive Chinese restaurants started opening as well. Up to the first half of the 1900s, rural people didn’t eat much rice. Instead, grains such as barley, buckwheat and millet were eaten — rice was for richer people. Only at the start of the 1900s did soy sauce become affordable for everyone, making it the national condiment of Japan. Before that, they only had miso. At the same time, tea became affordable for everyone. In the 1920s, electricity started to become available for powering kitchens. By the 1930s, new housing was being constructed with running water inside the house, and in the 1950s, refrigerators started to become common. The period of greatest foreign influence on food so far has been the last half of the 1900s. The American Occupation lasted from 1945–1952. In 1947, the American occupation authorities introduced lunches at school for children. This got Japanese at a young age trying bread, milk, curries, hamburgers, and spaghetti. After the 1950s, regional and class distinctions in food started to blur. It was partly caused by people from various regions moving to various cities for work during the economic boom that began in the 1960s. 2001 – In November 2001, the Martha Stewart Store opened in the fashionable Yurakucho district of Tokyo. Fish names in Japanese often change depending on how mature the fish is. Most Japanese will call “tofu” anything that looks like tofu, regardless of what it’s made with. Demetriou, Danielle and Henry Samuel. Michelin makes Tokyo haute cuisine’s home. London: Daily Telegraph. 21 November 2007. Samuel, Henry. Michelin awards Tokyo most 3-star restaurants in blow to Paris. London: Daily Telegraph. 17 November 2009. Askkenazi, Michael. The Cheeses of Hokkaido and other Milky Issues in a Ricist Society.. In: Milk: Beyond the Dairy : Proceedings of the Oxford Symposium on Food and Cookery 1999. Harlan Walker, editor. Oxford Symposium. 2000-08-01. Establishing A Stable Potato Production System In Japan And Developing New Varieties With Specific End-Use Characteristics. Motoyuki Mori Potato Breeding Laboratory, Department of Upland Agriculture National Agricultural Research Center for Hokkaido Region Memuro-cho, Hokkaido, Japan. 1 December 2004. Shoji, Kaori. Taste: the final frontier. Tokyo, Japan: Japan Times. 23 March 2004. United States Department of Agriculture. Japanese market for microwaveable foods heats up. Washington, DC. AgExporter Magazine. October 1993.